Note: Changing the name of a datacenter after the datacenter entity was created and saved is not supported in DataStax Enterprise or Lifecyle Manager. 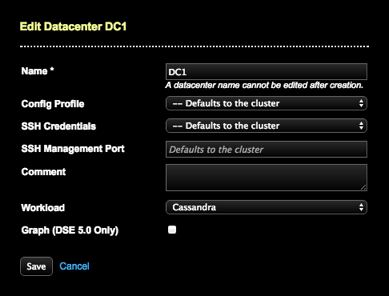 Select the datacenter to edit in the Datacenters pane and choose Edit from the Datacenters pane menu. The Edit Datacenter dialog appears. Make any necessary changes, such as selecting a new Config Profile to apply. Depending on the edit, run an install or configure job at the datacenter level.